I buy a lot from them - they are definitely military friendly. I am likely somewhat nieve, but I choose to believe that he doesn't have much bad to say about the products that he sells because he doesn't sell products that he thinks are bad. Lots of stuff readily available at other places, that he just won't carry. I buy a lot from them too. They're my go-to parts slinger. His reviews are probably the best out there and very truthful. But it's always only the positive because the underlying truth is that he's still a salesman. I don't mean that in a derogatory way. There are very few product reviews ANYWHERE that will give the good and bad of a product. For instance, I have a pair of A-star GP Pro gloves. They're fantastic gloves and fit well. However, the cuff is too small. With the straps completely loose, it's a struggle to get my hand through the cuff. The hand and finger fitment isn't even tight. That's just poor design. You never hear anything like that in most reviews. Why would he tell you anything that might prevent you from buying? I have zero reservations about buying anything from them though. I was on a first name basis with one of their sales guys. I dropped a few grand with them on my track conversion and some gear. They gave me a 10% discount on the entire purchase. I wanted to buy some boots, but was torn on size. So I bought both sizes with them knowing full well I was going to return one of them. They were cool with it. Hell, I've got a $300 order pending with them right now. Even if they don't have something on their site, I'll call and see if they can get it. I only go somewhere else for things they can't get, or OEM parts. What I remember mostly is... ground, sky, ground, sky, ground, sky, emergency room. I have the GP Techs and no problems with them going over my leathers. A solid day in the five rfx1 and I'm very happy. The dexterity is incredible. The palms did turn my pink grips black but that's hardly a real complaint. Shoot me a PM if anyone is in need of a K4-K5 600/750 Ohlins rear shock. Apparently you can't get anyone to approve threads in the classifieds section, so off to ebay I go unfortunately. Front tire warmer had an element burn through so sent them to Woodcraft to see if they can be repaired. I got the set second hand because my previous warmers for the SV wouldn't fit the wider rear of the GSXR, so not sure how old the set is. Can't be repaired, but Woodcraft has a nice trade in program that gives you credit toward a new set. So I guess I know what I'm getting for Christmas. I just got my new upper from ArmorBodies. Had a 2 month backorder that ended up being 3 months. So after taxes (my small business that pays for my TD habit didn't do so well this year) I'll be shopping seriously for a new helmet. Looking forward to the long holiday weekend to start fitting the new upper. koth442, tigerblade and JCW like this. I went tool hunting/shopping for fork service tools and found this great video from STG. Going to install some cartridges and "save" me the cost of install. Thanks. Will try this on the knee pucks I've been watching. koth442 and JCW like this. Went ahead and got the pucks. Noticed them discounted because they weren't the correct color. They're supposed to be yellow but came out more orange than normal. Last year I added a bit of color to my leathers and one of those colors is pretty close to this so Woodcraft's trash becomes my treasure, for 35 bucks. Who was looking for rearsets? I think I may try Heroic or Racer for my next set of gloves. You won't be disappointed with the Racer Gloves they're all I have worn for about 8 years now. I have three sets of them. and yes they have been crash tested twice I am still wearing the set I tested. So it's looking like my first trackdays in late April won't be on the menu, as the track is currently under water. What track is that? I didn't see it mentioned in the article. Raceway Park of the Midlands ("RPM", formerly known as Mid America Motorplex, or "MAM"). Found this posted on a car forum: "Raceway Park of the Midlands ( about 20 miles South of the Omaha/Council Bluffs metro ) where quite a few of our members have raced is under 10 foot of water, with only the roof of the Clubhouse and the upper seats of the grandstand visible." Yeah just talked to the owner of Ducati Omaha/TrackAddix. Omaha itself is pretty okay but the track is 10 ft under. I'm flabbergasted at how much water that. Unbelievable. Thank God no water here. MSRH was 71 degrees on Saturday and the rain missed everyone, BUT I was signed up for Sunday. Over night rain came in and it dropped to 50 degrees. By noon rain was gone track dried up. I had my slicks on and no warmers, so I rode 3-4 laps each session before I could turn up the speed. Wind breaker over leathers was awesome. Still had a pretty good day. There were 12 crashes lol, from first lap race winners haha. Most people who passed me in first laps got caught and passed in the last laps. Next TD is COTA in May with Fubar. Im ready to go. 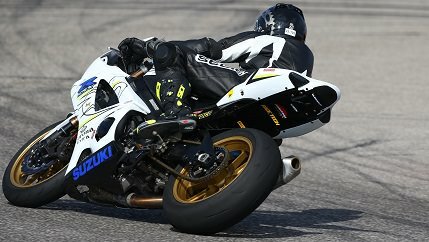 I kick off the track season this weekend at ncbike. Supposed to be in the 70's and mostly sunny. I'm very excited. Newyork, Racerxxxgsxr1000 and JCW like this. Ancient history now... but I will NOT ride in rain with supercorsa sp's anymore. koth442 and Newyork like this. 95% going to CMP Saturday. Mostly cloudy and mid 70s is my perfect day. I'm just crossing my fingers that the Friday rain moves off but it is looking good at the moment. Who's hosting this Saturday at CMP? Have fun! And don't forget tire money lol! Just raced there this past weekend with AHRMA, will be back next week there with CCS / ASRA. koth442 and rv6john like this. Hopefully I'll see you guys there sometime this season! It's only ~5 hours from Knoxville! It's looking like perfect weather for ncbike too. I need to try out CMP, but it's a haul for me so needs to be really worth it. Signed up and about to swap some fresh tires on the bike. I've got the same issue. I would like to try NCBIKE but 5 1/2 hour drive one way, probably 6+ pulling the trailer, has kept me closer. I'm not sure I'd make a 5+ hour drive for CMP. I think the layout is more interesting than NCBIKE but still pretty flat. I do enjoy each time I'm there. Ncbike is great training ground. Its about 4.5 hours for me. You spend to much time on the edge of the tire and with it being a pretty short lap you can really work on understanding how input into your controls impacts how the bike tracks. The facility itself isnt amazing for bikes but decent and pit in/out isnt really my favorite. NCBike looks like a nice flowy track. I like the layout. Unfortunately it's 7 hours straight driving from Knoxville. I probably won't make it to that one. I genuinely salty I'm not going to make it to Heartland Raceway in Topeka KS. Looks like a really fun track. Both times I've planned to go, the event was cancelled before hand. Let's go! I'll be there Saturday with a Ducati buddy of mine. Evolve gt is hosting. Bring a genny if you run warmers. Ready to go with a forecast of 76 and partly sunny on Saturday! I'd love to but the bike I was building for track has to be tuned before it's gonna be ready. Been in the shop waiting on dyno time for like 2 months now. I'm not sure I'd want to run my busa there without doing a bit more modifications to get it ready.